God wants us to learn how to face life with joy and confidence. To do this we must learn to be content in all the varying circumstances of life. In this lesson we are going to learn a great truth that can change our life. What is this truth? 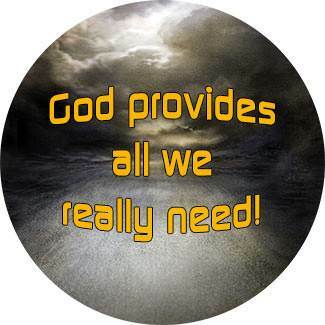 It is this: God and what God provides for me is all I need. · God supplies our material needs. · God supplies our deepest inner needs. 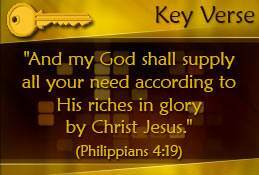 · God supplies our spiritual needs. · God freely gives us all things. "With the goodness of God to desire our highest welfare, the wisdom of God to plan it, and the power of God to achieve it, what do we lack? Surely we are the most favored of all creatures." We need to understand how Satan tempts us. Most, if not all, of Satan's temptations have to do with putting wrong thoughts into our mind. 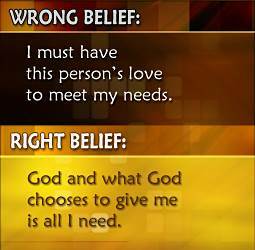 Satan puts thoughts like these into our mind: "God has not provided all you need. You need something other than God and what He has provided for you." This was exactly the way Satan tempted the first man and woman. Adam and Eve were created by God and placed in a beautiful garden which God Himself had planted for them. In the Garden of Eden was every tree that was pleasant to the sight and good for food. Adam and Eve had a work to do for God—they took care of the garden God had planted. They were loved and accepted by God. They had daily fellowship with Him. They had a perfect environment. Picture a circle and let it represent the world God provided for Adam and Eve. In the world that was theirs, Adam and Eve had everything they needed. If they had needed anything else, God surely would have provided it. Adam and Eve could truly say, "God and what God has provided for us is all we need." We might wonder how Satan could tempt someone who was living in a perfect environment, but Satan's temptation to Eve was very simple. He suggested to Eve that she and her husband needed something other than what God had provided for them. Satan wanted Eve to think, "God is holding back from us something that is good." Eve accepted Satan's lie. It became a belief in her mind and she acted on it. She ate the forbidden fruit. She gave some to her husband and he also ate it. Their disobedience brought sin and death into the world, along with all the sorrow, misery, and heartache that results from sin. Again, let each of us picture a circle and let it represent the circumstances that God has arranged for us. Inside the circle that is ours, God has provided all that we really need. Things are not perfect in our little "circle," nor will they ever be in this life. We live in a world that is under the curse of sin. Therefore we will face many trials and troubles. God has not promised us an easy time in this life, nor has He promised to give us everything we want. But He has promised to meet our needs and to be with us always. 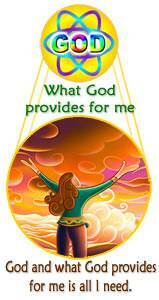 I can truly say, "God and what God provides for me is all I need." Satan, our great enemy, will seek to deceive us as he deceived Adam and Eve. He will seek to put wrong thoughts into our minds. Satan will point to something outside of our "circle," and suggest to us, "You need this. In fact, you cannot be happy unless you have it." We may not be able to keep Satan from suggesting a wrong thought to us, but we can refuse to accept it. To see the danger of accepting wrong thoughts, we need to be reminded of this truth: We are controlled by the way we inwardly see and believe things to be. What we believe determines what we do and what we feel. If we accept a wrong thought, it becomes a wrong belief, and wrong beliefs lead to wrong actions and wrong feelings. These wrong feelings usually lead to inner problems. Christians, as well as unsaved people, have inner problems such as resentment, fear, worry, guilt, and feelings of rejection. 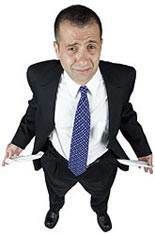 To overcome these problems, we must discover what causes them and how to deal with them. At the root of most inner problems is the wrong belief that we need something other than God and what God has provided for us. Let us consider some common problems and see the wrong thinking that is involved in each of them. 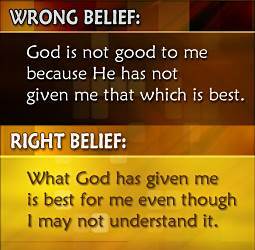 Resentment comes when we believe that what God has provided for us is not best. We may resent something about ourselves. We may resent our parents or some member of our family. We may resent our circumstances. We may even resent God. 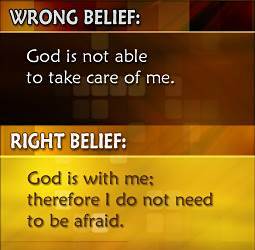 When I am fearful, it means that I am not trusting God to take care of me. God knows our hearts and He knows the tendency we have toward fear. Hundreds of times in the Bible, He says to us, "Fear not." We worry or become anxious because we do not believe that God will take care of us or meet our needs. 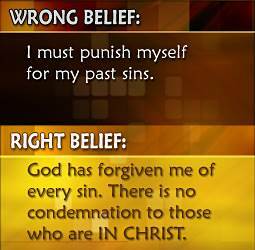 Guilt is that feeling of condemnation that we have when we think about our sins. Constantly remembering our sins can cause us great distress. At the root of this problem is our failure to realize and count on the fact that God has provided absolute forgiveness for us. 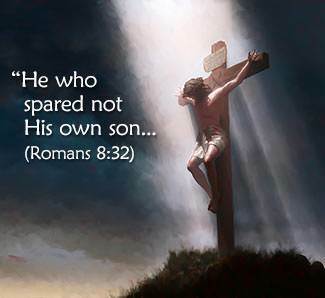 He has provided a Savior—the perfect Savior, Jesus Christ. Sometimes our interest in a particular person grows until we feel that we must have that person's love in order to be happy. Yet the person does not seem to care for us. 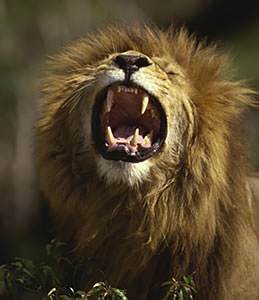 As a consequence, we feel rejected and hurt, and maybe even angry. At the root of the problem is the belief that I must have that particular person's love to meet my need. This is a wrong belief. God has promised to meet all my needs. The fact that He has not provided me with that person's love means that I do not really need it. I may feel that I need that person's love, and I may be grieved and hurt because I do not have it. 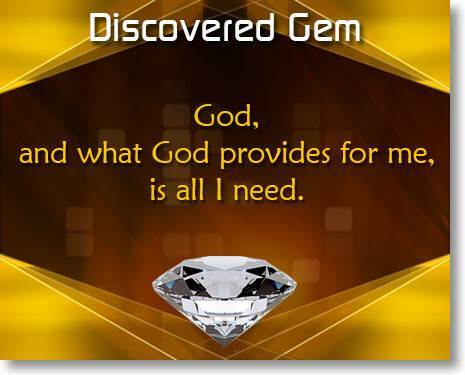 But I must come back to this great truth: God and what God provides for me is all I need. It is not wrong to love someone and to be grieved when that person does not respond to your love. But you must never assume that you must have that person's love to meet your need. Actually, Christ, and only Christ, can fully satisfy our heart. No human being can do this. If we seek from people what can be found only in Christ, we will be disappointed. The love of Christ alone can fully satisfy our heart. While each of these inner problems is different, all have the same root. 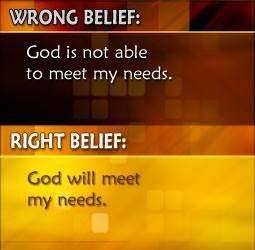 The root cause in each case is the wrong belief that we need some thing other than God and what God has provided for us. In each case, the remedy is to come back to this great truth: God and what God provides for me is all I need. 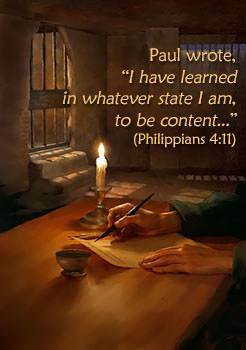 Whether he had much or little whether he was out of prison or in prison, whether he was abounding or in distress, Paul had learned to be content. He had learned that God and what God provided for him was all he needed. Paul said. What is the secret of contentment? The secret of contentment is believing that God and what God has provided for me is all I need. It is learning to be content in whatever "circle" God has provided for me. In this verse, God tells us why we are to be content. 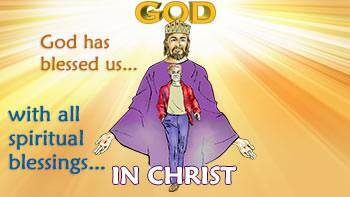 We are to be content because (1) we have the Lord Himself living in us, and (2) we have the things that He has provided for us. This is all we need.